Not that I ever counted all the angels in Barcelona! 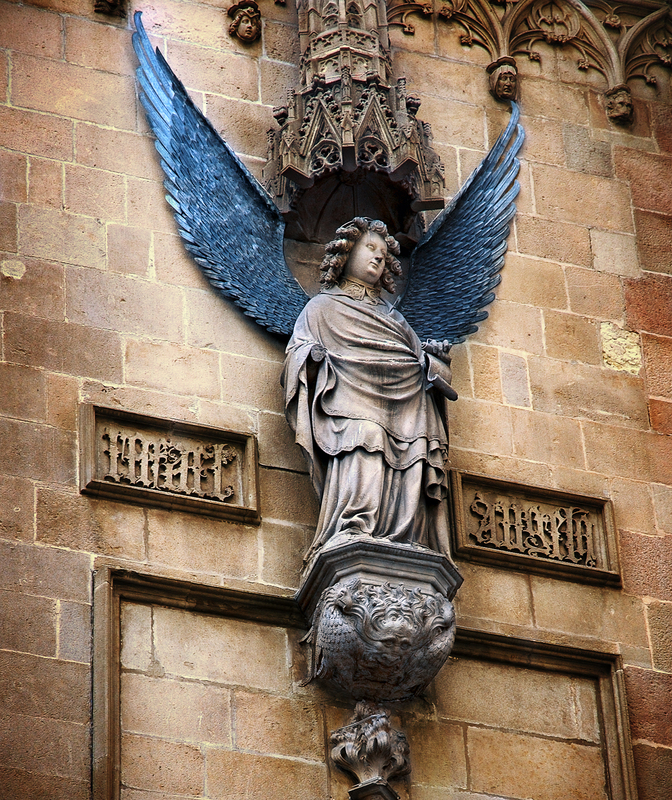 I just wanted to use a poetic license to honor my city and what better than this angel you can admire right after you leave Sant Jaume square on your way down Carrer de la Ciutat. You will find a small set of stairs to your right and voilà. Let me show you the place in a small picture: Carrer de la Ciutat near Plaça Sant Jaume via QDQ. That in the background is Sant Jaume where La Generalitat and the City Town Hall or Ajuntament are. I was in Placa San Juame during Merce for the castellars. I have never seen so many people in one place in my life! The mayor (at least I think it was the mayor) watched from a balcony overlooking the placa. He had the best view! It's a lovely, lovely place. I'll have to look at my photos to see if I have the ngel in any. mais uma bonita imagem e bastante representativa.